Japanese Daiki Ito had a moment of shock before his final jump. Ito slipped off the bar and was sliding down the inrun. The Japenese didn't suffer any injuries but was not allowed to jump again. So Ito, who was second after the first round, lost the chance to achieve a top result. 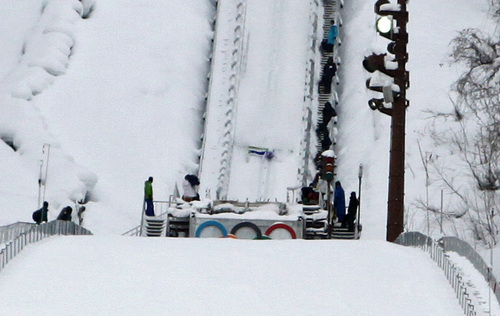 Few images are lonelier than the ski jumper, used to soaring through the sky, futilely clawing at the snow-packed ground as he awkwardly slides down a ramp. Better luck next year, Daiko.